The global market for mushrooms has witnessed growth at an impressive pace in the past few years, chiefly owing to the vast rise in consumption of processed foods, rising consumer awareness about health benefits of mushrooms, and advancements in packaging technologies to increase shelf life of mushrooms. Owing to the vast rise in demand for processed food products and the increased consumption of brown mushrooms, the mushroom market is expected to present significant growth and investment opportunities for players operating in the market, especially in the Asia Pacific region. Owing to the increasing number of companies and the intensifying competition, companies in the market are emphasizing on market consolidation by participating in activities such as mergers and acquisitions with food and beverages companies and distributors in new geographical markets. Mergers, acquisitions, and collaborations in the market are expected to have a major transformational effect on the growth dynamics of the market in the near future, opening up growth opportunities for the market across unconventional regional markets, to say the least. The increasing rate of urbanization in Asia Pacific, Europe and North America is expected to cause a major shift towards preference for packaged food, further stimulating the market for Mushroom. Transparency Market Research estimates that the revenue generated from the global mushroom market will be at US$36,825.4 mn by the end of 2016 and is expected to exhibit a CAGR of 8.2% from 2016 to 2024, rising to a valuation of US$69,267.9 by 2024. In terms of form, the global mushroom market is segmented in the report into fresh mushroom and processed mushroom. The segment of processed mushrooms is further segmented into dried mushroom, frozen mushroom, and canned mushroom. Of these, the segment of fresh mushrooms accounted for a dominant 56.5% of the global market in 2016. The segment is expected to retain dominance in the global mushroom market by the end of forecast period as well, exhibiting a promising 8.3% CAGR. In the processed mushrooms segment, the sub-segment of drier mushrooms will present the most promising growth opportunities, expanding at a CAGR of 8.9% over the report’s forecast period. From a geographical standpoint, North America is the leading contributor of revenue to the global mushroom market, accounting for a share of nearly 34% in 2016 in the global market. The huge market for processed foods, high dependence on imported products, and the continuously rising demand for mushrooms in foods and beverages are expected to allow North America mushroom market to keep the top spot in the global market throughout the forecast period. The regional market also benefits from a highly advanced packaging industry, technologically advanced storage equipment, and intensive expenditure in research and development activities aimed at finding new packaging technologies that can keep mushrooms fresh for longer durations. While North America holds the top position in the mushroom market, the Asia Pacific market is expected to present the most promising growth opportunities for players in the global mushroom market. The Asia Pacific mushroom market is expected to exhibit a CAGR of 8.8% over the forecast period. The significant growth prospects of the Asia Pacific mushroom market include the vast rise in consumption from the health-conscious population, rising production volumes of a variety of mushrooms, and the rising focus of key global players on making vast investments in R&D activities in the thriving food and beverages industry. 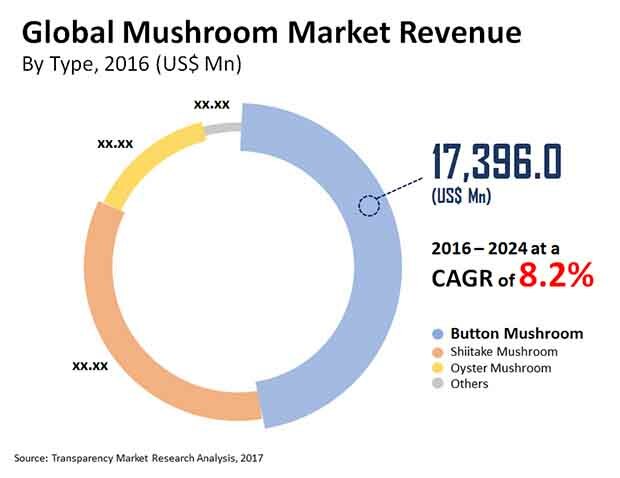 Some of the leading players operating in the global mushroom market are Costa Group, Okechamp S.A., Monterey Mushrooms Inc., Monaghan Mushrooms, Drinkwater’s Mushroom Ltd., The Mushroom Company, Shanghai Finc Bio-Tech Inc., CMP Mushrooms Greenyard NV (Lutèce), and Bonduelle SA.